Author(s): Yawen Zeng, Biotechnology and Genetic Resources Institute, Yunnan Academy of Agricultural Sciences, Kunming 50205, P.R.China. Jiazhen Yang, Juan Du, Xiaoying Pu, Xiaomen Yang, Shuming Yang, Tao Yang. Sleep is a vital segment of life, however, the mechanisms of diet promoting sleep are unclear and are the focus of research. Insomnia is a general sleep disorder and functional foods are known to play a key role in the prevention of insomnia. A number of studies have demonstrated that major insomnia risk factors in human being are less functional foods in dietary. There are higher functional components in functional foods promoting sleep, including tryptophan, GABA, calcium, potassium, melatonin, pyridoxine, L-ornithine and hexadecanoic acid; but wake-promoting neurochemical factors include serotonin, noradrenalin, acetylcholine, histamine, orexin and so on. The factors promoting sleep in human being are the functional foods include barley grass powder, whole grains, maca, panax, Lingzhi, asparagus powder, lettuce, cherry, kiwifruits, walnut, schisandra wine, and milk; Barley grass powder with higher GABA and calcium, as well as potassium is the most ideal functional food promoting sleep, however, the sleep duration for modern humans is associated with food structure of ancient humans. In this review, we put forward possible mechanisms of functional components in foods promoting sleep. Although there is clear relevance between sleep and diet, their molecular mechanisms need to be studied further. 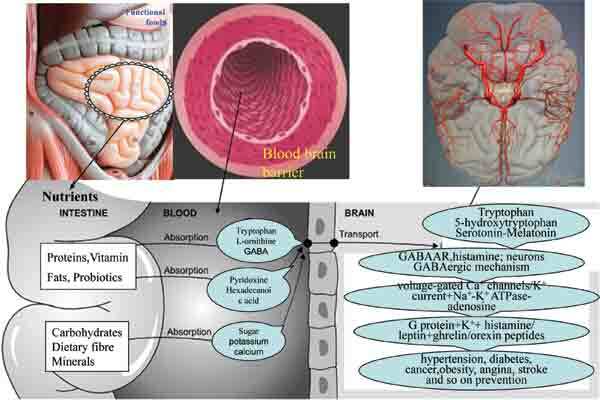 Keywords: Bioactive component, dietary, functional food, human being, insomnia, molecular mechanisms, sleep promoting. Affiliation:Biotechnology and Genetic Resources Institute, Yunnan Academy of Agricultural Sciences, Kunming 50205, P.R.China. Keywords:Bioactive component, dietary, functional food, human being, insomnia, molecular mechanisms, sleep promoting. Abstract:Sleep is a vital segment of life, however, the mechanisms of diet promoting sleep are unclear and are the focus of research. Insomnia is a general sleep disorder and functional foods are known to play a key role in the prevention of insomnia. A number of studies have demonstrated that major insomnia risk factors in human being are less functional foods in dietary. There are higher functional components in functional foods promoting sleep, including tryptophan, GABA, calcium, potassium, melatonin, pyridoxine, L-ornithine and hexadecanoic acid; but wake-promoting neurochemical factors include serotonin, noradrenalin, acetylcholine, histamine, orexin and so on. The factors promoting sleep in human being are the functional foods include barley grass powder, whole grains, maca, panax, Lingzhi, asparagus powder, lettuce, cherry, kiwifruits, walnut, schisandra wine, and milk; Barley grass powder with higher GABA and calcium, as well as potassium is the most ideal functional food promoting sleep, however, the sleep duration for modern humans is associated with food structure of ancient humans. In this review, we put forward possible mechanisms of functional components in foods promoting sleep. Although there is clear relevance between sleep and diet, their molecular mechanisms need to be studied further.